2011! What? How’d that happen already? Well, it’s here and the changing of another year has passed me by in a non-threatening blur of crosswords, novel-reading, and playing 500 with Mum and Dad at the beach. And being absent from the computer, which really wasn’t so bad at all. We’re back out to the beach tomorrow, using the very last of my leave, but Tim’s back to work tomorrow – he heroically came out to help us erect the tents and then cover them with tarps (couldn’t possibly buy a new tent or anything) which we managed to do without having a family meltdown, maybe some lasting buried tension but no meltdown. In the meantime I’m serving up a recipe that I made for Christmas night, which…seems like an extremely long time ago now. And a mighty fine Christmas it was too, I was lucky enough to get heaps of food-related things which I’m sure will all eventually appear here on the blog when I get back to Wellington. So, apologies for the now outdated Christmas imagery in the background…should have thought more about this and posed the cake in front of a beachtowel or a picture of a dolphin or something to make it more generally summery. Ever since I can remember we’ve spent Christmas evening with the family who grew up next door to my Mum’s family, and this year I was asked to bring along a pudding (suspect I would have taken it upon myself to bring one along whether it was asked for or not). 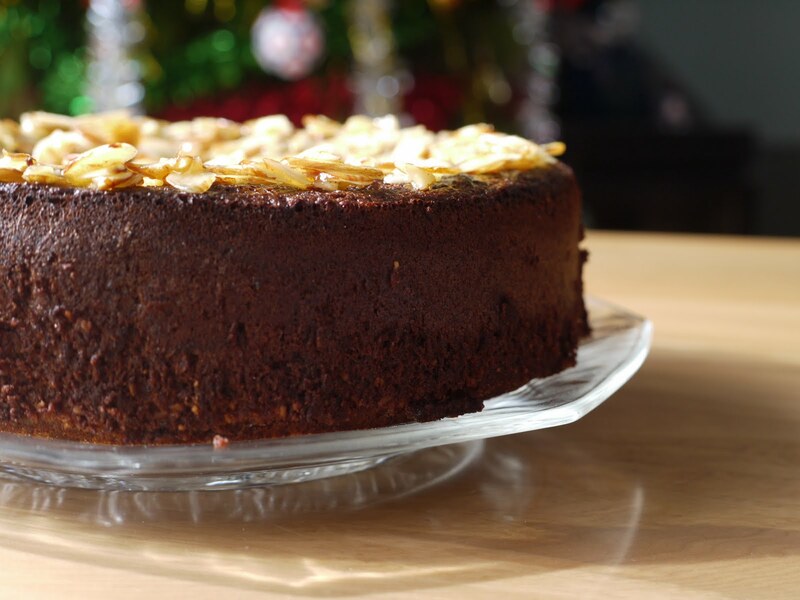 The open brief of “bring pudding” is one of my favourites and for some reason, out of all the many many pudding recipes Nigella has (or anyone, but for me Christmas is Nigella’s time to shine more than usual) my heart set itself on her Christmas-Spiced Chocolate Cake. 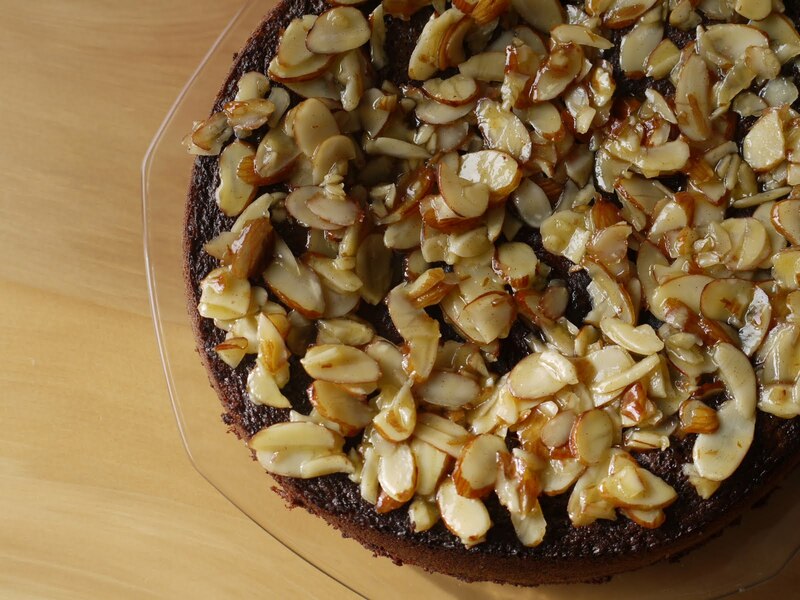 It’s a variation on her flourless chocolate cake, gussied up with the yuledtidish fragrance of cinnamon, cloves and orange. 50g flaked almonds (they tend to come in 70g packets, you can use the lot here no worries). While the chocolate is cooling, add the sugar and vanilla to the eggs and whip together till thick and pale and at least doubled in texture. This is easier with an electric beater but not impossible with a whisk. Gently fold in the rest of the ingredients, including the magically delicious chocolate-butter mixture. A big silicon spatula is best for this, and for transferring the mixture into the tin. Bake for about 35-45 minutes, and allow to col completely. For the topping, simmer all the ingredients together till thick and syrupy and then topple them over the chocolate cake, which may well have dipped significantly in the centre. This cake is seriously fantastic, chocolatey in an upfront way but without making you feel like you’re eating a damp, cocoa-scented piece of soap, as some flourless chocolate cakes can taste. 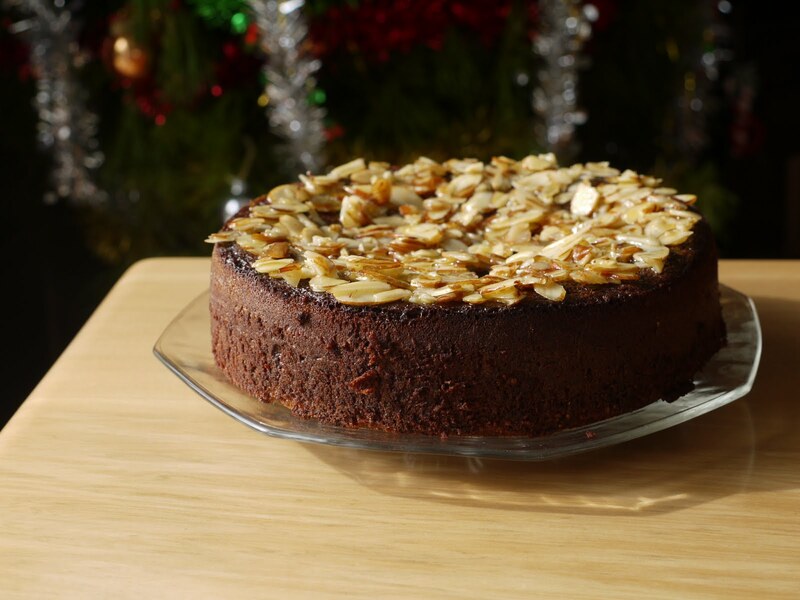 The spices give it a real Christmassiness, showing that the sort of flavours which might show up in a fruitcake are equally fantastic against the slight grit of the ground almonds and the richness from the chocolate. 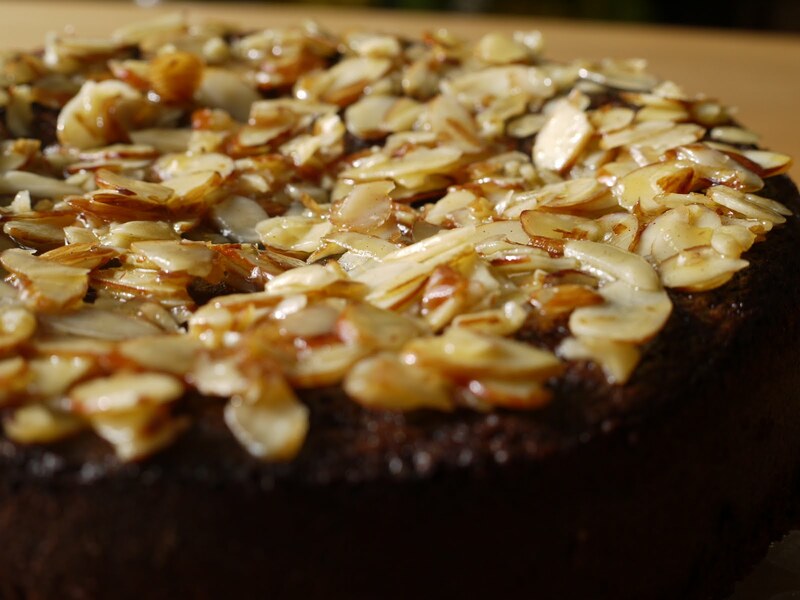 The sticky, orange-syruped almonds on top make it look beautiful too – I just bunged them on and they somehow looked amazing, like shining golden tiles, so if you even put in the slightest bit of effort you’re guaranteed some gorgeousness. This overachiever of a cake is also gluten-free and keeps for ages. Hopefully everyone had a decent Christmas/New Years – I don’t really go in for resolutions, preferring to take each day as it comes but also to be receptive to as much positivity, creativity and safe fun as possible. Hope all that comes your way too. Title via: Something about the panicky nature of Blackout from the fantastic Broadway musical In The Heights makes me feel slightly bad about appropriating their “powerless, we are powerless” line…not so bad that I haven’t done it. 1. You play 500? AWESOME! I haven't played that in years, which makes me feel sad. 2. You used the term “gussied”. A thousand points towards life for that. This sounds so comforting and I like that it seems so foolproof. It's been ages since I've played 500! Looks awesome as usual. Hope you had a great New Year, Laura! You people know when i see these images on the site i really became hungry and thursty. But now its the new year and let me do some stuff regarding food for my self lolzzz.. Your blog makes me smile so much. You are fabulous. As fabulous as Nigella. Which really is the highest praise.